I've seen a lot of informal uprights and brooms, but I don't think I've seen any crape myrtles styled in the way that they naturally grow. Is it even possible for them to grow that way as bonsai? Re: Natural style crape myrtle? Depends on what you mean by as "they naturally grow". I haven't seen any in the wild. In landscapes, they can be pruned to grow as multistemmed bushes, or as clumped or single-trunked trees. Oliver Muscio wrote: Depends on what you mean by as "they naturally grow". I haven't seen any in the wild. In landscapes, they can be pruned to grow as multistemmed bushes, or as clumped or single-trunked trees. If Crape Myrtle are not pruned they develop multiple stems as mentioned and very fine branching, because each time they bloom and each year as they come out of dormancy they develop natural ramification. But, they also get really large, so I am not sure that would work except for a very large bonsai. If left long enough they will have only one bloom per small twig. Russell had one posted a few days ago. It's probably the best natural designed crepe myrtle you'll ever see. Personally, I think these are the best I've seen. 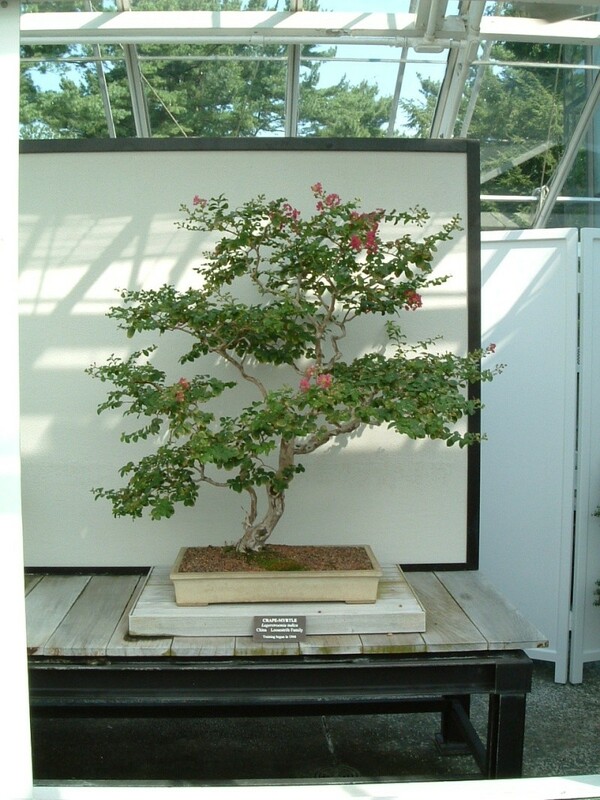 As soon as you force crape myrtles into a bonsai "style" you screw them up. Thanks guys. I guess I find the multiple trunk, "clump" shape of natural crape myrtles to be unique and special. It seems like it may be very hard to get one to grow like that as bonsai though. That's kind of a bummer. I have two "dwarf" crape myrtle that do not produce suckers. I have another crape myrtle that does. What I am suggesting is that variety of Crape Myrtle will make a difference n how they grow and perform as bonsai. BTW< I saw a very large crape myrtle in the gardens at University of North Carolina, Chapel Hill today, the trunk was smooth and very red/maroon. 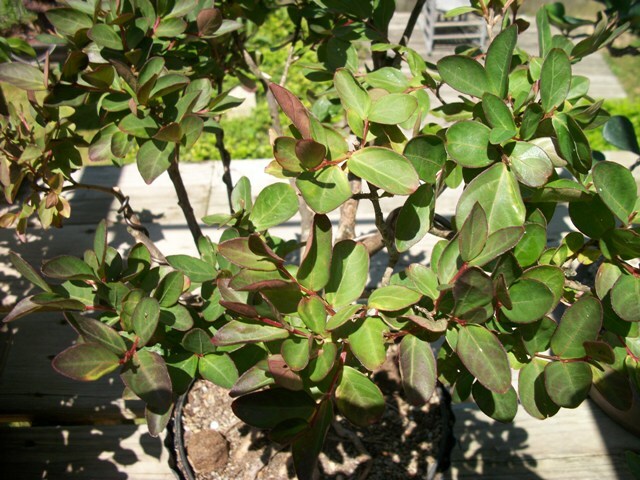 Billy M. Rhodes wrote: I have two "dwarf" crape myrtle that do not produce suckers. I have another crape myrtle that does. What I am suggesting is that variety of Crape Myrtle will make a difference n how they grow and perform as bonsai. BTW< I saw a very large crape myrtle in the gardens at University of North Carolina, Chapel Hill today, the trunk was smooth and very red/maroon. The tree I took cuttings is at least 40 years old and has one main trunk and four other suckers turned trunks that all start at the ground level. The cutting are certainly a long way off from being anything resembling a proper tree, but maybe there is hope. If they are cuttings, what they turn out looking like depends on YOU! That's an interesting range of styles (I'm talking about the ones in the above link, and the ones in Russell's original thread) - and they all look really good. I'd happily take any of them. I'm working on a crape myrtle that I acquired as very young nursery stock a couple of years ago, but it's slow going in this climate...can't put them in the ground unfortunately! I'm still tempted to get one of those dwarf cultivars but haven't pulled the trigger yet. My sister used to live in Virginia Beach and they had a beautiful multi-trunked crape myrtle in the front yard. Must have been 20-25 feet tall and had stunning, mottled bark. I have no idea what variety it was and never took a cutting. I have a question for you. If, after these cuttings get rooted, I plant them in the ground and let them grow freely, how long do you think they could take to reach two inches or so in thickness? Right now, they are about as thick as a pencil. If remember correctly, they are a tropical species, and zone, they would be getting full sun, high temperature and humidity for much of the year. Well, only a few years - but what are you trying to accomplish? If you plant them and walk away you're going to have wonderful landscape trees, but useless bonsai material. We share a long growing season, and you're going to be constantly cutting them back to nothing and letting regrow if you ever hope to have anything but broomsticks. Obviously, that's going to slow them down considerably but it's what you're going to have to do if you expect to have anything to show for it. I'd consider growing them off in big pots, but at least they are easy to dig and hard to kill. Crape myrtles aren't tropical, but tolerate tropical from what I've gathered here. The huge one I mentioned in my other post was close to a big koi pond that I walked across the first winter I was in Japan - and I ain't Jesus. PeacefulAres wrote: I have a question for you. If, after these cuttings get rooted, I plant them in the ground and let them grow freely, how long do you think they could take to reach two inches or so in thickness? Right now, they are about as thick as a pencil. If remember correctly, they are a tropical species, and zone, they would be getting full sun, high temperature and humidity for much of the year. Highly depends on the variety, fast growing (large variety) can get to 2" in a couple of years, the dwarf ones may take 5 times longer. Poink88 wrote: Highly depends on the variety, fast growing (large variety) can get to 2" in a couple of years, the dwarf ones may take 5 times longer. Any pictures of the parent tree? Indica or indica x fauriei hybrid? Russell...lovely specimen from Longwood...thanks for sharing. Question...do you think you could identify my cultivar from a close up of the foliage...from what I have read, the leaf size seems to be smaller than most I have referenced....Thanks in advance for your time. Tom, we could probably get close. I'd like to see it grow out and even flower, that would be best. I'm sure some of my grower friends would know. Thanks, Russell...I will forward a foliage shot along....I am hoping that the tree will flower later this summer....in that regard I will be refraining from any further pruning. I've seen quite a few "unmolested" crape myrtles and they're always in clump form. Check out the pictures in the link below. Sorry for the sideways shot, I couldn't figure out how to rotate them. Russell and Mr. Lo have some of the best I've ever seen as natural bonsai. I've yet to see one in the ground where it could be collected that was worthy for bonsai. They grow too fast here to have any taper unless you're constantly on them. I just planted one in the ground this year. We'll see what becomes of it. I think I've seen Crape Myrtles as landscape trees in Naples. I don't know what part of SW FL you're in but I lived in Ft. Myers for 12 years. This is a split trunk Crape myrtle by James J. Smith that is on permanent display at Heathcote Botanical Gardens in Ft. Pierce, FL. Another beautiful specimen, Patrick....thanks for sharing! I would ask for help in identification of the attached image of the foliage of my crepe...sorry, no flowers yet....thanks in advance. That certainly shoots down the theory that crapes don't flower as bonsai because you have to prune them too much! Tom, that's what I was expecting. It could be a mid-sized dwarf indica with red or dark pink flowers. I'll get some names but we may need flowers to narrow it down. Thanks, Russell...hopefully I will be posting some flowers later on this summer. I appreciate your help.